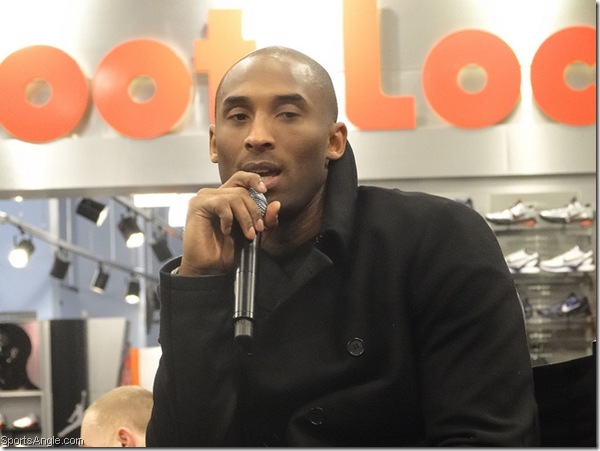 Kobe Bryant sat on stage at Foot Locker on 34th Street in New York City on Friday night, his congenial nature thinly veiling his inherent razor-sharp focus, which had been on full display at Madison Square Garden just an hour beforehand. 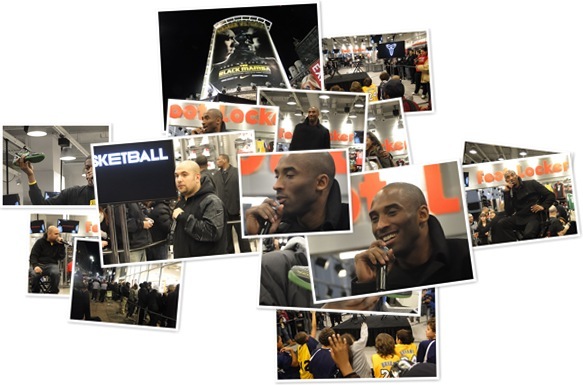 Make no mistake: Though Kobe was relaxed and enjoying himself while entertaining and inspiring his young fans, his drive to succeed in all aspects of his career was on full display at Foot Locker UnlockedÃ¢â‚¬â„¢s event to promote the release of the Nike Kobe VI Supreme/Rice. The crowd, composed of sneakerheads and Kobe aficionados that had waited outside for hours to purchase the Kobe VI Rice (and the legendary royal blue Foamposite) and have an audience with the Black Mamba, murmured at his comment. The challenge is learning how to take a collection of guys that all have different personalities and different backgrounds, and make sure everybody stays on the same page. And everybody stays motivated and stays focused on what the job is. ThatÃ¢â‚¬â„¢s the biggest challenge. To get caught up in the Ã¢â‚¬Å“scoring is easyÃ¢â‚¬Â portion of what he said is to miss the bigger picture. Kobe BryantÃ¢â‚¬â„¢s true success has come not from his ability to put up numbers, but from figuring out that he had to become a leader not just physically, but strategically. Knowing that it was important to his legacy to win titles without Shaquille OÃ¢â‚¬â„¢Neal on his team, Kobe figured out that he needed to modify not so much his game, but his modus operandi. In the span of two years, Kobe went from lamenting his teammatesÃ¢â‚¬â„¢ weaknesses to figuring out how best to maximize their strengths. He melded his skills with his supporting cast, became the best true leader in the NBA, and was able to add two more championship notches in his belt as a result. At the same time, he steadfastly maintained and nurtured his individual brilliance. During his interview with Rosenberg, Kobe aptly compared himself to Kanye West in that they both think outside the box, but the similarities go far beyond that. Both of them have achieved total mastery in their fields — and they have no problem embracing that. What some might construe as arrogance is really more the confidence that goes along with a healthily functioning ego fueled by vast accomplishment. As LeBron James has taken the baton as the NBAÃ¢â‚¬â„¢s preeminent antihero, right now is truly KobeÃ¢â‚¬â„¢s moment. With the All-Star Game a week away, Kobe gets the front-and-center assignment in New York City, aided by serendipitous scheduling. He gets the Witness treatment with an enormous Times Square billboard. And he gets the big-time marketing paintbrush, a mini-movie directed by Robert Rodriguez in the Machete mold (including a much-welcomed appearance by Danny Trejo). As a huge fan of RodriguezÃ¢â‚¬â„¢s movies, I have to consider this one of the coolest ad campaigns in quite some time, blending fantasy with sport reminiscent of LeBronÃ¢â‚¬â„¢s sophomore season Chamber of Fear ads. Among the ways that Kobe has emerged as the most plausible of any of the candidates to be the Ã¢â‚¬Å“Air ApparentÃ¢â‚¬Â is his Jordan-esque attention to detail. Kobe, like me a Rodriguez fan, cited the need to do something different from Ã¢â‚¬Å“just your generic shoe commercial.Ã¢â‚¬Â He also worked hand-in-hand with Nike on the sneakers themselves, asking that the Kobe VI be softer and lighter than the VÃ¢â‚¬â„¢s, but remaining close to the ground. ItÃ¢â‚¬â„¢s apparent KobeÃ¢â‚¬â„¢s at ease with the spotlight he has diligently worked for and earned. 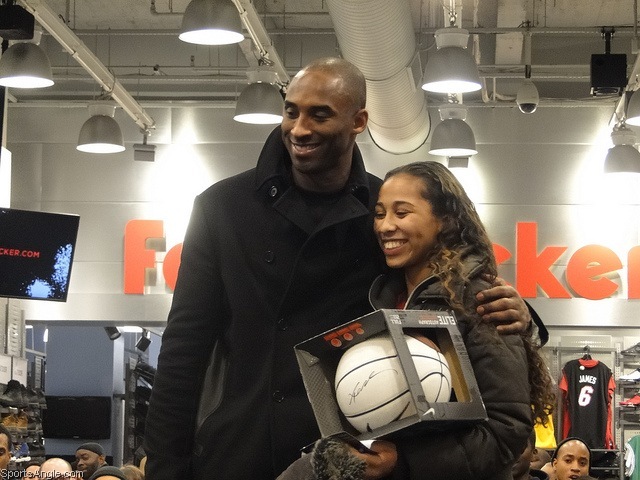 Looking as if he hadnÃ¢â‚¬â„¢t broken a sweat against the Knicks — for all we know, he didnÃ¢â‚¬â„¢t — KobeÃ¢â‚¬â„¢s vibrant personality shone through as he took questions from several kids in the crowd, then presented them with signed basketballs on stage and posed for pictures. One girl admitted nervously she was on the verge of tears simply from meeting him. 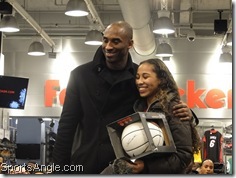 The kids wearing KobeÃ¢â‚¬â„¢s jersey at Foot Locker on Friday night worship him plain and simply for being the best. But as he implied, strip away the scoring titles and you have a man even more worthy of looking up to. Nobody understands the value of hard work like Bryant; as a result, nobodyÃ¢â‚¬â„¢s better at their craft than he is, and nobody is as comfortable in his own skin. That confidence resonates all the way to his opponents, who are aware he doesnÃ¢â‚¬â„¢t expect to lose. Though he has five championships, you know Kobe wants more than anything in the world to win his third straight title this year. ItÃ¢â‚¬â„¢s difficult to say anyoneÃ¢â‚¬â„¢s as good as Jordan was, but matching the BullsÃ¢â‚¬â„¢ Ã¢â‚¬Å“repeat-threepeatÃ¢â‚¬Â would seem to put Bryant at least in the discussion. And isnÃ¢â‚¬â„¢t that what life should be about for all of us? No matter how much you accomplish, thereÃ¢â‚¬â„¢s always another level to reach, more improvements to make, another goal to aspire to. ThatÃ¢â‚¬â„¢s what keeps us alive, the constant desire not to settle for simply good enough. It should be obvious by now that looking up to Kobe Bryant is not exclusive to kids.